“Home is where the heart is.” A house transforms into a home with its people, their feelings, and their togetherness. Each home speaks to the personality of its inhabitants. And who wouldn’t love their place to feel a little more spacious, bright, and homey? While a bigger home is everyone’s dream, you can make the most of your place by maximizing the available space. Apegeo brings you some astonishing tips and ideas to make the most of your space and liven up the decor with a modern touch. 1. This bunk bed is classy and saves space. Swap a traditional bed with this bunk bed to create that much-needed extra space in your child’s room for play or study. With a minimalistic and modern design, it’s easy on the eyes. Plus, it takes care of the issue of privacy too. 2. Get the best of both worlds: a study and a sitting area. Are you unable to decide whether you want a desk or a sofa in your room? Why not both? 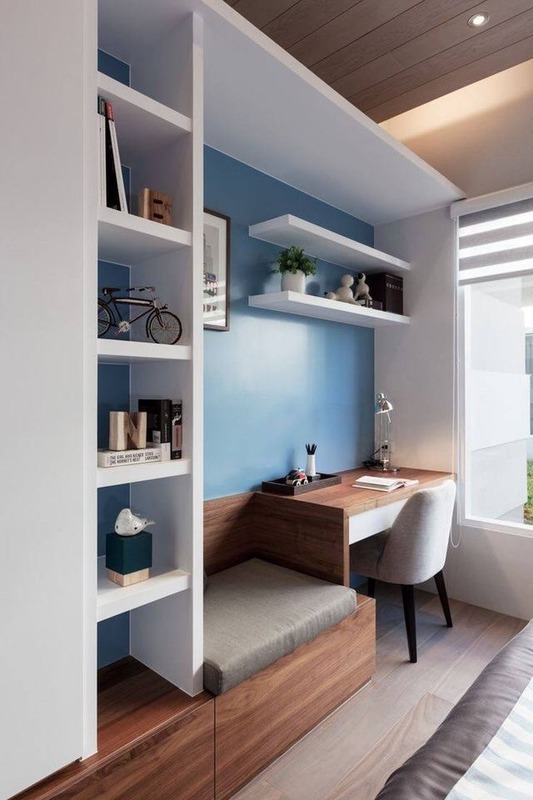 With this space-saving, minimalist design, you can include both in your room. This also makes space for storing books and papers. 3. Play with colors and designs. Use empty wall space and create this unique decor-plus-storage area. Keep books, keepsakes, souvenirs, or anything on this built-in unit. The use of contrasting colors accentuates the style and makes the wall stand out. 4. Use the vertical space to double the room. A bed atop your work-space or vice versa — this 2-in-1 design is the future. Make use of the vertical space — add stairs and double the available space in your room. Use the top floor for anything — a secluded reading space, work desk, or even an extra bed. Instead of just a traditional drawer, modify a table that can be lifted up, for under-the-hood storage space. Attach a mirror on the underside, and there you go — a classy vanity with all your things in one place. You’ll never have to look for your accessories in different places again. You could even customize it as a study desk or a craft corner. 6. Murphy beds are the future. Murphy beds or wall beds are great multifunctional pieces of furniture. Use it as a sofa during the day and a bed by night. It’s great for small spaces, where there can’t be a separate guest room. 7. If height is an issue, here are some pull-out bunk beds. If vertical space is limited, these pull-out bunk beds work just wonderfully. Space-saving, minimalist, and great for homes with a lot of kids. Instead of beds, you can also customize the space as a pull-out cabinet to store toys for kids or extra bedding. Now, that’s what you call a space-saving plus a space-doubling hack. This false floor offers a huge amount of storage space without much effort. The area above can always be used however you want, while your things are stowed beneath. This decor is truly carving out its own niche. 9. Store regular-use items under a sitting area. This space works best for things that are used frequently. Just open the cabinet when you need something, and shove it back in without much hassle. This works best for toys, shoes, or even books. 10. Utilize your side tables with pull-out custom fittings. Side tables rarely add to the storage in the room. Customize them and make a pull-out drawer where you can store your night routine essentials like books, candles, moisturizers, etc.